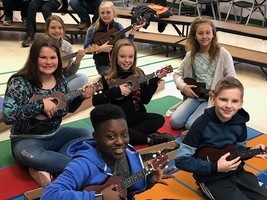 Students in the 6th and 7th Grade had the opportunity to spend the day in Columbia, SC. 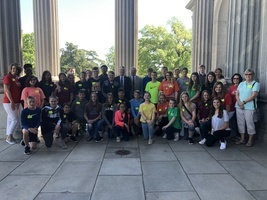 They were able to visit the South Carolina State House where they met Representative Craig Gagnon and Representative Jay West! They also had a blast while visiting Riverbanks Zoo! Students planted lettuce, broccoli, and cauliflower in the school garden. After spring break, they will examine a variety of seeds, choose what they would like to plant and discover which seeds grow quicker. Members of the CTE Running Club participated in a 5k at Erskine College. Students have been training hard each week and we are so proud of them for completing this race! 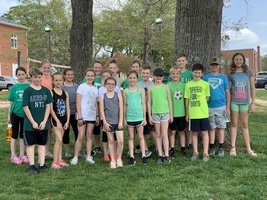 Congratulations to our CTE Running Club! 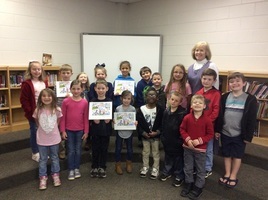 "Pig and Goat's Fabulous Adventures"
Students in Mrs. Patterson's first grade class worked together to write the book, "Pig and Goat's Fabulous Adventures." This book was selected as a semi-finalist in the National Book Challenge! 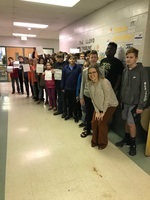 Congratulations to Mrs. Patterson and her class! First Graders Learn to Shag! 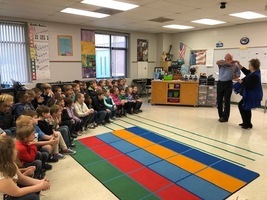 In honor of South Carolina Day, students in first grade had the opportunity to learn how to do our state dance from our very own superintendent, Dr. Betty Jo Hall! A big thanks to Dr. Hall and Mr. Wally for coming out to CTE and demonstrating the Shag and teaching our students how to do this fun dance! Mrs. Cann's Class Celebrates South Carolina Day 2019! Kindergarten students in Mrs. Cann's class enjoyed learning about our wonderful state! 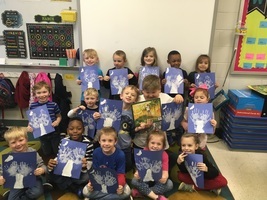 To celebrate South Carolina Day, they read the book P is for Palmetto by Carol Crane and created the South Carolina State Flag using their hand prints. CTE seventh graders enjoyed a visit from the Greenwood Genetics Center. Congratulations to CTE sixth grader, Ansley Prescott! This is her fourth year winning our school wide Spelling Bee! 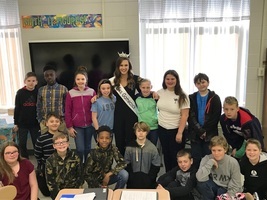 Miss Gamecock, Sara Beth Sears, visited 5th grade at Cherokee Trail to read a motivational book about careers and speak to them about the importance of math and science in pharmacy. Congratulations to CTE Fourth Grader, Brennan Louk! 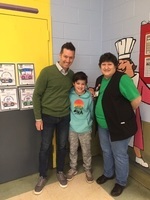 He was the District wide Grand Prize Winner for National School Breakfast Week! Pictured L-R: Mr. Clendaniel, Brennan Louk, and Mrs. Donna Gambrell. CTE students enjoyed their first day of Running Club! 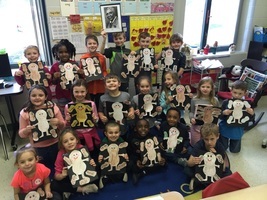 First graders at CTE celebrate the life of George Washington Carver! Students wrote facts about this great scientist. They were amazed to discover the many uses of peanuts! Cherokee Trail Elementary Sixth Graders participated in the annual Science Fair. Congratulations to our winners! 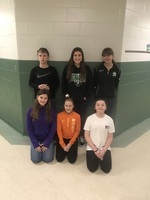 L-R: Drew Biggerstaff (3rd Place), Coen Clendaniel (Honorable Mention), Daniel Moore (Honorable Mention), Kenadi Humphreys (2nd Place), Ansley Prescott (Best Presentation), and Giulia Giammarinaro (3rd Place). Not pictured: Zak Taylor (First Place). Mrs. Hopkins' and Mrs. Eaves' classes enjoyed a day of fun as well as learning! The students played Valentine's Day Bingo and learned new words about love and friendship. 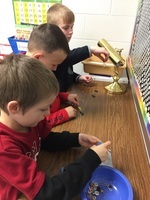 Students in Mrs. Austin's second grade class enjoyed experimenting with magnets in science. CTE Students Having Fun in Math! 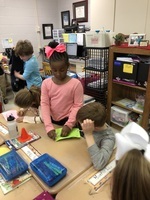 Students in Mrs. Johnson's first grade class and Mrs. Eaves' second grade class joined together to make a math manipulative called Rekenrek. 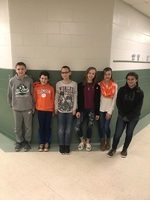 CTE Terrific Kids for the month of January were recognized. 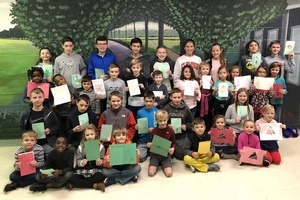 CTE Terrific Kids for the month of December were recognized. Teacher Cadets from Dixie High School Make an Impact! 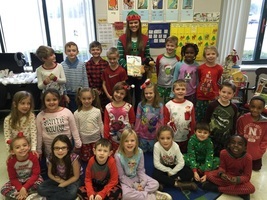 Lindsay Sykes, teacher cadet from Dixie High School presents Mrs. Johnson's first graders with a book for their classroom library. "Homer" the Homework Hound will be taken home to encourage extra reading. 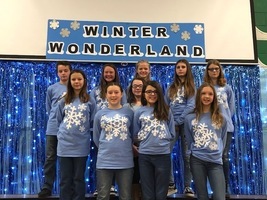 Sixth and Seventh Grade Chorus members performed in the winter concert. This year's theme was Winter Wonderland. Mrs. Patterson's First Grade class used Oreo cookies to study the phases of the moon. 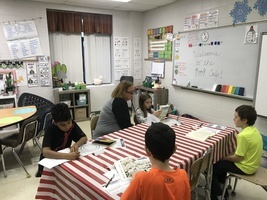 Mrs. Hines' fourth grade students participated in a book tasting event! 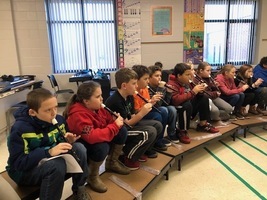 They experienced many different genres during this activity. CTE seventh graders enjoy reading with first grade students each week! 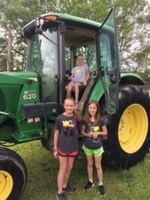 Mrs. Eaves' Second Graders Give Back! 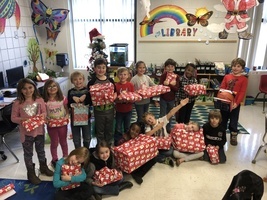 Second grade students in Mrs. Eaves' class enjoyed purchasing and wrapping presents for a special Angel Tree Child. They enjoyed giving back!